Dr. Lorena E. Castaneda is your optometrist in Northwest Houston! Dr. Lorena E. Castaneda was born in El Salvador and moved to Texas in 1982. While in her native country, Dr. Castaneda attended the prestigious Maria Auxiliadora Catholic School and undertook a rigorous academic program that earned her several academic honors and awards. She was also a member of the national swimming and volley ball teams. Dr. Castaneda participated in many national and international competitions earning several titles and setting national and international records. Dr. Castaneda moved to Texas where she continued her education at Southwest Texas State University, San Marcos, Texas. She completed an intense three-year academic program and clinical rotations at Seton Gen. Hospital, Brackenridge Gen. Hospital, and St. David’s Gen. Hospital in the Respiratory and Pulmonary Services Departments. While at Southwest Tx. St. University, she was awarded the Roy’s Honor Scholarship and the Good Neighbor’s Outstanding Academic Achievement Award for three consecutive years. Dr. Castaneda graduated from Southwest Tx. St. University with High Honors and with a degree in Allied Health Sciences in Respiratory Therapy. Dr. Castaneda continued her studies at the University of Houston where she obtained a Bachelor of Science in Biology in 1993. She entered the University of Houston College of Optomety and obtained her Doctorate in 1998. While in Optometry School, she received six letters of Clinical Excellence from the Academic Affair Committee as well as letters of commendation from Dr. Charles Garcia and Dr. Scott Sawyer for Outstanding Clinical Skills during clinical externship rotations. Throughout her career, Dr. Castaneda has been recognized with several awards including the American Top Optometry Award, The Who’s Who in America, and the Who’s Who Madison. 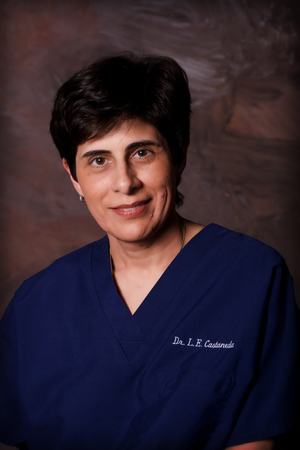 Dr. Castaneda has worked with both ophthalmologic and optometric practices over the past 16 years which has given her extensive experience in the field of diagnosis, treatment, and management of eye disease, Vision Therapy, and post surgical co-management of cataract, Pterygium, and refractive surgical cases. She also served as part-time Adjunct Clinical Professor at the University of Houston College of Optometry for 5 years. Dr. Castaneda is a therapeutically certified and glaucoma specialized optometrist and is the preferred co-managing LASIK doctor for the Eye Center of Texas. She also has many years of experience fitting regular contact lenses and “specialty” contact lens such as Scleral, Semi-Scleral, Keratoconic, Postsurgical lenses, SynergEyes lenses, infants and young patients with specific ocular/visual conditions. She is also very interested in Corneal Molding fitting. Dr. Castaneda’s practice philosophy is patient oriented as she takes the time to listen to her patients, answers their questions, and explains their conditions thoroughly. She enjoys working with patients of all ages at her practice. She is fluent in English and Spanish. In her spare time, she enjoys spending time with her family and her dog, swimming, reading, and exploring archeological sites in Latin America.